Why Target Date Funds? provides a concise overview of the most common “default” 401(k) investment option. The booklet and tri-fold brochure explain how Target Date Funds balance growth and safety at different points in the lifecycle, maintain that balance in response to market changes, and how they perform. It also discusses fees and other considerations when deciding whether to invest in Target Date Funds. Why Target Date Funds? is available for $2.25 each (1-99 copies) or $2.00 each (100 or more copies), plus shipping. To place an order, click here. 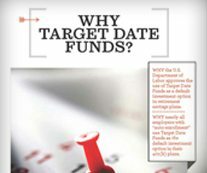 The Why Target Date Funds? brochure is available for $1.75 each (1-99 copies) or $1.50 each (100 or more copies), plus shipping. To place an order, click here.